The 2020 Democratic field is so crowded that it’s easy to forget all the candidates who are running. Cable news seems to have forgotten several already — especially when the Mueller report is the news of the week. Last month, we looked at the relative amount of coverage each candidate got on the three major cable news networks when they launched their campaigns and found that Bernie Sanders and Beto O’Rourke received much more media attention for their kickoffs than other candidates. Now that some time has passed — most campaigns are up and running1 — almost all the candidates2 are receiving less coverage than they did a few weeks ago. That means some candidates were barely mentioned at all. According to data from the TV News Archive, coverage of the 2020 Democratic candidates in the week of March 24 declined across the board from the previous week.3 That’s because CNN, Fox News and MSNBC focused instead on the conclusion of special counsel Robert Mueller’s investigation. 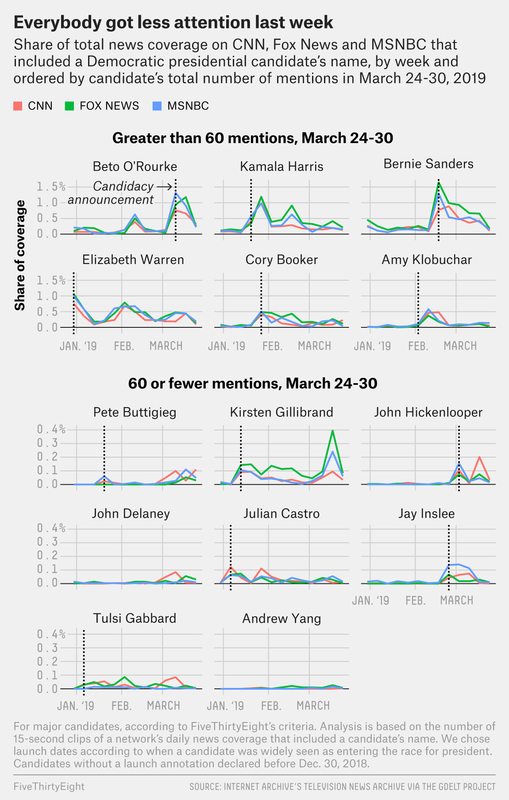 Still, in the past week, Beto O’Rourke got the most coverage of any candidate on cable news, with Kamala Harris, Sanders, Elizabeth Warren and Cory Booker all at least 95 mentions behind. Jay Inslee, Andrew Yang and Tulsi Gabbard got next to no coverage. As coverage of the Democratic primaries begins to ramp up, we’ll be keeping track of the amount and type of coverage that candidates receive on cable TV to get a sense of which candidates are making a splash on the national stage and how the national networks are thinking about and portraying the primary race. The big exception is former Vice President Joe Biden, who’s still expected to enter the race. We are including only people who meet our criteria for a “major” candidate. The GDELT Television API, which processes the data from the TV News Archive, measures a week of coverage from Sunday through Saturday. The cutoff for measuring coverage for any given day is at midnight EST. The TV News Archive measures coverage by splitting the daily news footage across the three channels into 15-second clips and finding the share of those clips that contain a mention our search query. Our search queries are the full names of each candidate.